Attached to the boxes is a speaker enclosure used to broadcast Swift calls and designed to deflect most of the sound upwards away from my neighbours' house. 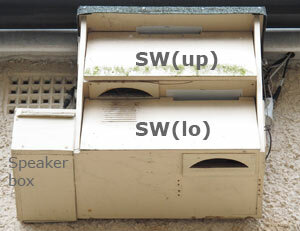 Later this year I may replace these nest boxes with a neater side by side arrangement. 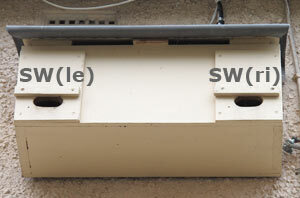 This pair of Swift boxes is at the western end of the wall. The boxes were originally put up for Starlings. Both boxes are equipped with cameras and microphones. New for 2012 this group of Swift boxes is on the front of the house, facing East. 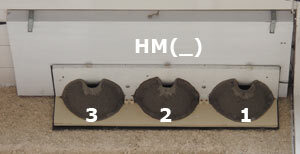 They will not have cameras installed permanently but in boxes 1 - 3 there is a small hole into the loft to allow for a microphone or small camera to be used on a temporary basis when nesting takes place. Also on the front way is this trio of artificial House Martin nests. Not used since a complete brood died of starvation during bad weather in 2007. However, the boxes are equipped with cameras and monitoring continues each year. 18 June - A busy weekend has meant that I have had little time to follow swift activities. While working out in the garden I heard a few individual birds screaming, but even with improved weather there was little sign of airborne groups over us. In the two active boxes little has changed, apart from the two chicks in SW(le) having been fed regularly and looking healthy during their first few days after hatching. They now have a month to prepare for their African marathon, with fledging due 20 - 22 July. Let's hope that the worst of the weather is now behind us. Having said that I understand that there is another threat of heavy rain for the tail end of this week. 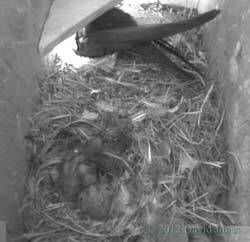 Just before 7pm this evening the chicks were left on their own for what I think may have been the first time. However, they were only alone for a few minutes before a parent returned with food. As I relaxed with a cup of tea this afternoon I saw a Swift enter the nest box across our road (that is visible from our lounge). A couple of minutes later a Swift left. It could have been the same bird entering and leaving, but the timing suggests that a change-over may have been going on - perhaps incubating eggs or feeding young chicks? When we have guaranteed good weather I must set up a cctv camera to monitor the box in the next driveway down from us. I've seen a Swift enter the left-hand entrance and I want to capture a couple of hours in the evening on video to help me work out what may be going on in there. This evening the skies have cleared and at around 8.15pm I went outside and looked up to see in excess of fifty Swifts directly overhead! They were very high and clearly feeding, but as I watched the entire group gradually moved northwards. Ten minutes later and they had gone, and I could see just three 'locals' flying at a much lower altitude. Talking of Swifts on the move, a week or so ago I included a link to a BTO page about Swift migration. Well, here is an updated version of that story - following the travels of a single Swift between July 2010 and May 2011 - absolutely remarkable. 22 June - The weather has returned to its disappointing self, with today more like Autumn rather than mid-summer - grey skies and fresh to strong breeze from the south-west during the morning, followed by some very heavy rain showers with all too brief bright spells in the afternoon. In SW(le) the elder of the two chicks is now a week old, and you can see the difference just one day's development makes in this image from earlier this evening. Despite the less than helpful weather the parents seem to be collecting food for the pair, although whether it is enough remains to be seen. The pair in SW(ri) continue in residence each night, bringing in the occasional feather, but with no eggs as yet. There have been no more sightings of large groups of Swifts over us, and no visits to any of the other boxes on our house. 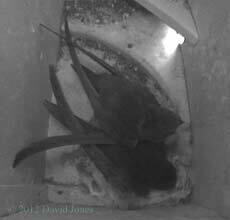 I have not yet attempted to video either of the active neighbouring nest boxes. Talking of videoing, a series of four (now five!) 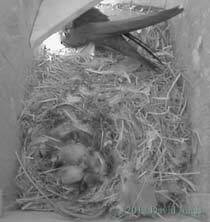 mains electricity power cuts this evening since 9pm have wiped today's video recordings of nest box activities. As the cuts are linked to a major problem in the area around Aldershot I've switched off the recorders until the morning to avoid the risk of damage to their hard drive. The webcam managed to continue with just a few second disruption as our computer network reset itself. Having said that, yesterday the webcam was out of action all morning as a result of a faults in the network of our cable provider, which knocked out both internet and TV links for the second time in a week. It's clearly a bad time for networks!